I wish I didn't have a third post in a row, but I still have something new, depicting the moments after Temre was dropped on the exhaust pipe that burned her. She had been leading a protection squad for some researchers on a dangerous planet, of whom Obligado was part of (who probably could have made a pretty good protector on his own), and she was attacked by one of the aliens she should have been capable of fighting off (which would be something like the mutated Gollum Raptors from Mirage vol 4) She was picked up off her walker, and did manage to get away. However, she had been dropped on researcher's habitation system exhaust pipe and was severely burned. The other soldiers chased it off while Obligado - and his companion Nalmar - were looking after her while proper medics were alerted. In the moment the creature dropped her, Temre barely felt the intensity of being dropped on the hot exhaust pipe. In a split moment, she felt the heat singe her skin, and hardly had time to scream before everything in her sight flashed bright white. The next thing she knew, she had been pulled away. Someone was holding her. She could feel something trickling down her scalp; she could not begin describe the pain in her side. Other than it was the worst she had ever experienced. It was painful to even attempt to breathe. "Temre?" She struggled for a moment to recognize the voice; she noticed the tentacle wrapped under her. It was familiar. The voice was familiar; she just couldn't put a name to it. "Temre can you hear me?" Temre fought for a breath; the dryness in her skin intensified; she could smell burning flesh. And blood. She finally screamed. "Nalmar!" Even in her pain, Temre finally put a name to the voice. Obligado! "I'm coming!" Someone else called. "I couldn't get the water to warm up!" Temre managed to look around, and saw Nalmar stumbling out of the research dome. She was carrying some damp towels. Nalmar gently laid a tentacle over her, passing one of the towels to Obligado, who laid it over the top of her scalp. She gasped at the coldness of it, and she was suddenly aware of punctures in that area - particularly one going deeper than the others. "Hold on, now..." Nalmar gently brushed her face before laying another over her side. Temre balked and slightly spasmed. She had expended all her energy; she couldn't find the strength to scream again. 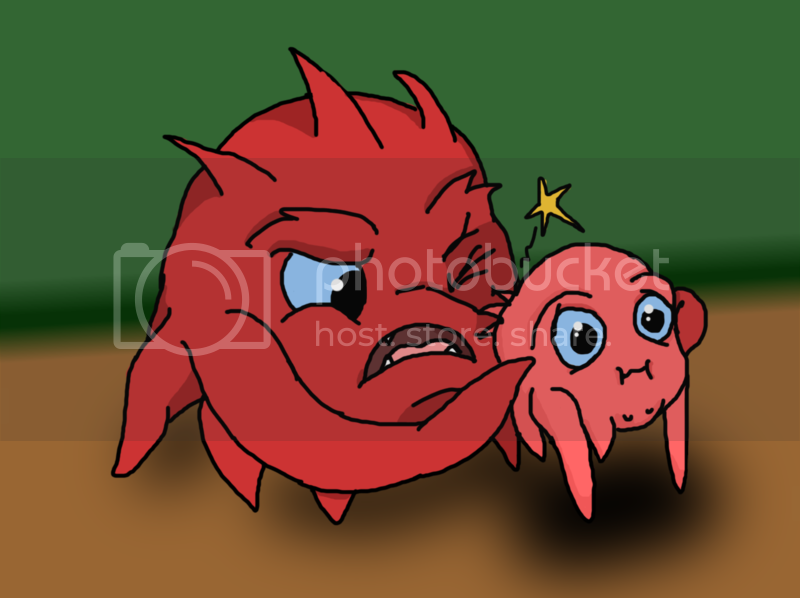 Instead, she clutched Obligado's tentacle and sobbed. "Help is on the way." Obligado gently assured her. Temre gulped, unable to move her tentacles to rub the tears off her face. She couldn't even attempt to speak. Instead, the white flash returned to her vision, and she weakly sank to the ground, blacking out once again. It's mostly my own interpretation; I would love to see something more official, but I'll have to go with wild speculation. Well, mostly wild, making guesses based of their physiology and what very little we have been given. At some point, I might compile my thoughts together. This was made in November, and will certainly be redone, since the tub is awkwardly formed in front of Temre's tentacles; it might even have to be completely redesigned. Quanin is questioning why Temre is bathing their son; after all, they have a nanny for that. A nanny who, at this point, has become more of a personal aid to Temre, since she was the one mostly caring for him. At this point, I was having a bit of trouble figuring out the leg formation of the walkers...so now, I'm probably going to go with the hoverseats of the 23k Utroms, or walkers like what the original Krang had...but without the screen. Hey, I did the remake! Honest question: what led to your obsession with Utroms? I suppose it's an affinity for obscure fantasy societies in general. On a real-world note, I had an obsession with learning about bats - and then snakes - in most of middle school. Through most of high school, I had something similar for the Rat Creatures from the Bone comics...who are still awesome, if not even more obscure. Then I watched Doctor Who and enjoyed the Daleks. I tried to create my own faction; a group that escaped the Time War and tried to reverse back into Kaleds somewhere deep in the universe. Ch'rell was the first Utrom I would ever see, and that was from Phelous' review of Turtles Forever, and I ended up watching three versions at once, then went into the comics. I wanted to look into Utroms for more inspiration for that group of Daleks, but they ended up being exactly what I wanted. Even with the Rat Creatures and Daleks, I'd still have a lot of enjoyment in figuring out what they were outside of how they're shown in canon. Where are the female Rat Creatures, I'd ask. What is life like for a single individual Dalek among the millions, I'd ask. With Utroms, one such question is how the **** they cram all their organs into their little round bodies. Developing Temre was probably the final nail in the head, because I haven't looked back since then. I haven't even posted all the potential I've worked on for her - especially as a combatant and military leader. I've enjoyed looking into single groups of things for a long time, and Utroms are just the next tier in that. They introduced me to quiche and began a legacy of obsession that has brought me to Utroms. There are a few sketches I've done that I should have put up a while ago...but still didn't. I like to think that the dinosaur-studying Utroms had some trouble with Velociraptors, but eventually just came to tolerate them. And, for the first time on this page, the turtles and Splinter. With...Xeinos and Leatherhead. I found them living with the turtles in Mirage vol. 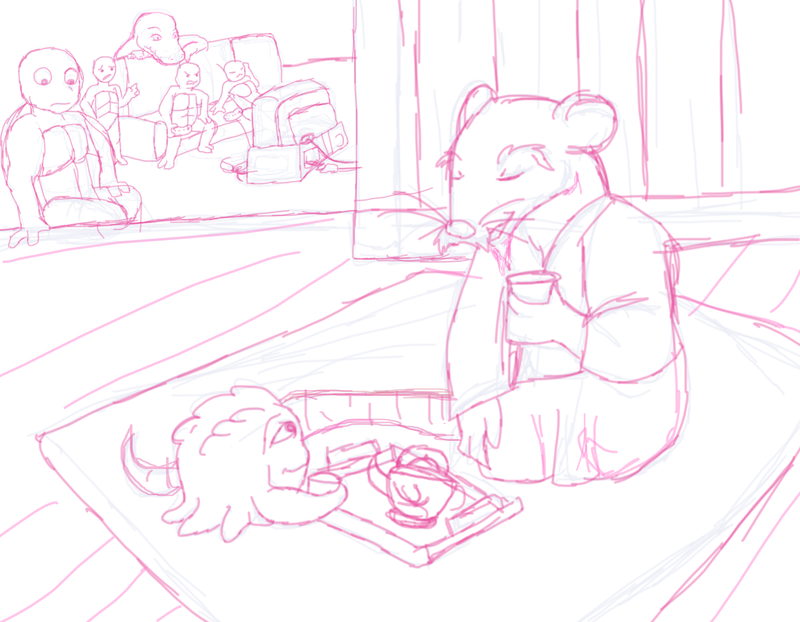 3 to be really sweet, including Xeinos' friendship with Splinter. I deliberately drew them without masks and their armor, mostly because I don't think they'd need to wear that stuff while they're just hanging out at home. It's not like they can't tell each other apart otherwise. Last edited by Utrommaniac; 07-09-2017 at 07:19 PM. I suppose they're at some kind of intergalactic UN? Last edited by Utrommaniac; 07-09-2017 at 07:21 PM. Several times; that art would mostly be found on my deviantART, as I haven't loaded everything I'd ever drawn. 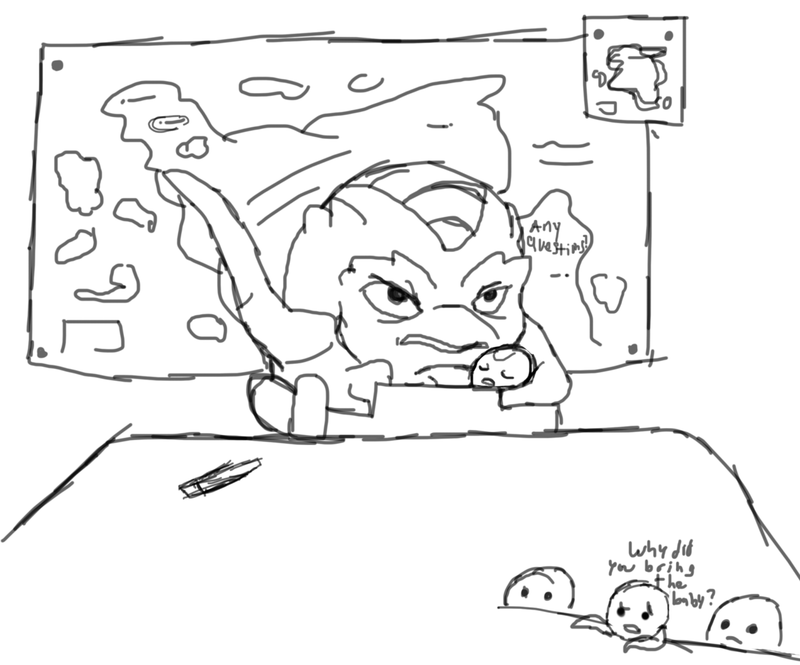 I have several thoughts on Utrom life, and this is one of them. Utrom mouths are pretty big, probably so when they were living pre-civilized lives, they could eat quickly without getting attacked by their natural predators. But it also helped to protect their offspring from danger, like a few types of fish on Earth. It's considered archaic for modern Utroms, even gross by some, but there are those that will still do it. They usually live in rural groups, and have their own opinion on those that object to mouth carrying: stuck up. Last edited by Utrommaniac; 07-02-2016 at 03:08 AM. 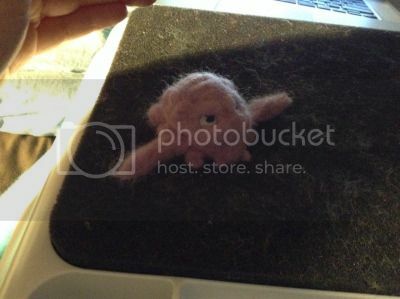 I discussed earlier that Temre used to carry Krang with her everywhere (I think). This is one such example where she'd even bring him to meetings and briefings. 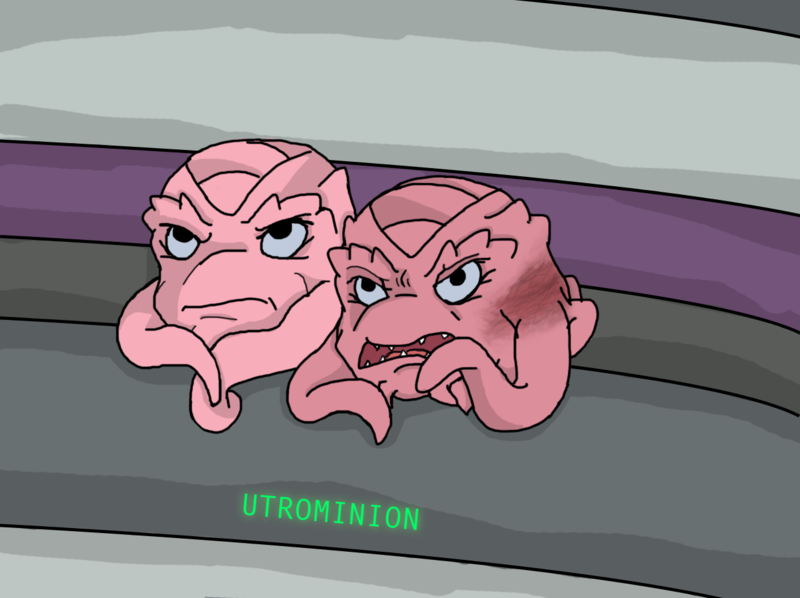 Utrom mouths are pretty big, probably so when they were living pre-civilized lives, they could eat quickly without getting attacked by their natural predators. But it also helped to protect their offspring from danger, like most types of fish on Earth. I'm sure that with how few of them are left, it would only make sense for most of them to bring their babies with them everywhere, especially considering the way the Burnow Island facilities are. Continuing in the story of Temre's burn recovery; her relationship with Quanin was already starting to bloom before she was wounded, but it flourished while she was recovering. Even when most of it was spent doped up on painkillers. Temre's mother's name is Ny'ena. She's a field medic, and obviously was a big head in Temre's recovery. Last edited by Utrommaniac; 08-04-2017 at 05:48 PM. You have a final design for her yet? 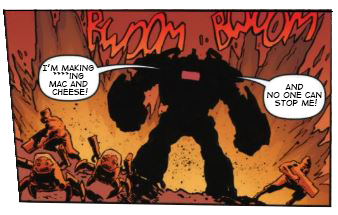 She's pretty much come down to it, save for trying to figure out setting her apart from Krang. I often put sketches together into one page, and this is the first one I've done in quite a long time. These are in pencil and ink. This is one of many designs I've done for Temre's armor, but I think this one is my favorite. I might build on it more at a later date. Two of the sketches are from attempts at a study for more energy and posture in Utroms - which is not an easy task. Churk ended up on it. 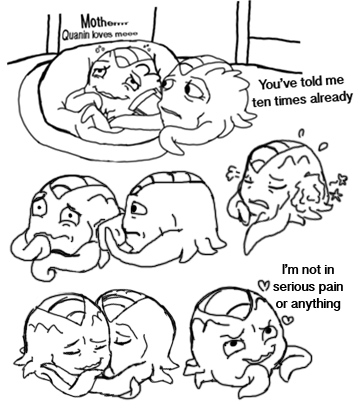 I have one big story in mind for when Temre gave birth to Krang, as a slice-of-life event, and part of it involved Quanin injuring himself cutting food for her. Because she had been in situations arguably more painful, Temre had the energy to tease him about it while the midwife (a Neutrino) stitched him up. Continuing Temre's "bring the baby everywhere" parenting, she would really just not have a care in the world where/when/in front of who she fed him. 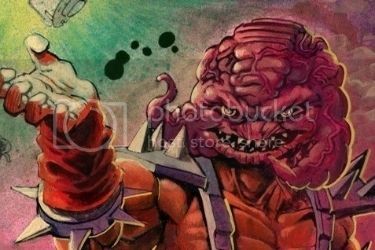 I not awake yet, so if I missed something in your thread, sorry..
You should make an Android Body for the Utrom known as Krang. 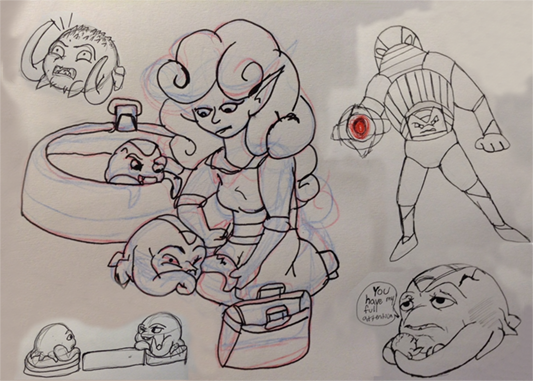 Krang's android body would probably be a horrifying mix of the IDW and original, but I haven't figured it out yet. 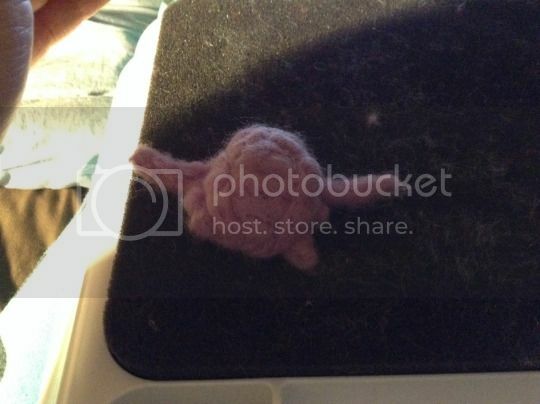 I did, however, make a needle-felted Krang. 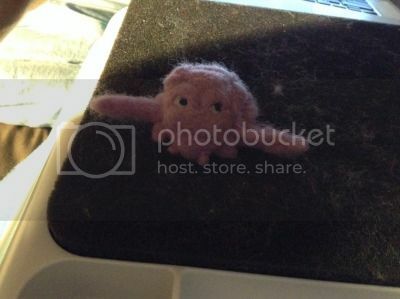 I poked myself with the felting needle twice while working on this. And yes...it did hurt. A lot. I like to think Ma'riell had caused a lot of damage with the frills on her back as a child/baby. Or at the least discomfort. 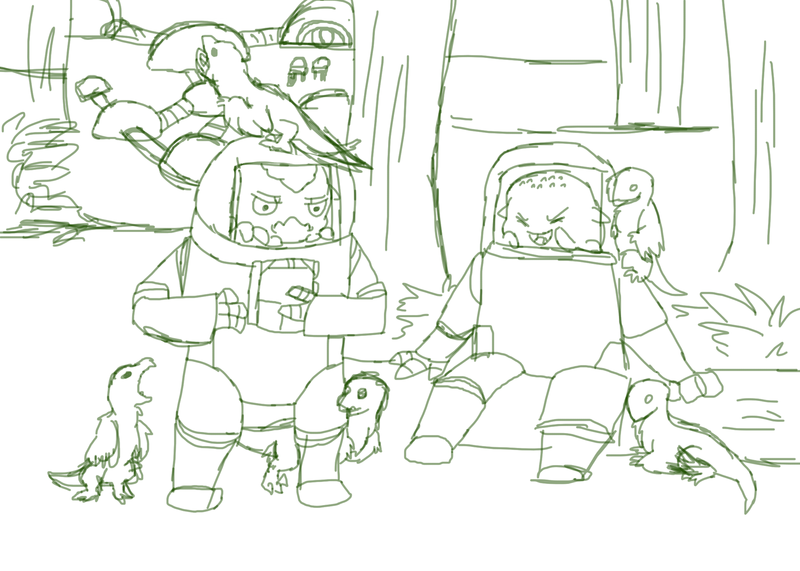 I also like to think of Ch'rell as being the older sibling. 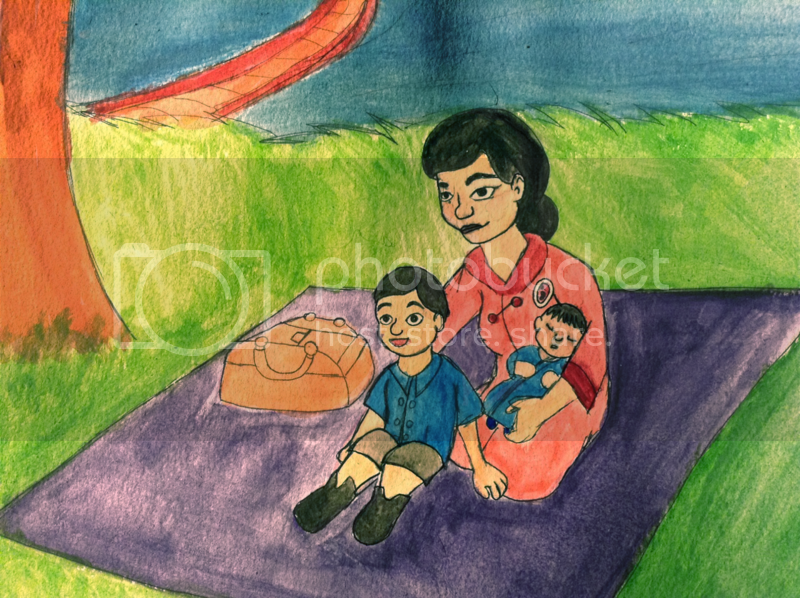 I got around to drawing Shredder's mother again, but this time in watercolor and with her boys. I had to take a picture with my iPad...so I had to toy around on Photoshop with the color. Is the Shredder's mother in the 1987 cartoonverse with Kazou Saki being the other brother?